Four of us were camped in the Little Five Lakes area, having backpacked in the previous day from Mineral King. Three were there for the express purpose of climbing Squaretop after being rebuffed the previous year due to weather. 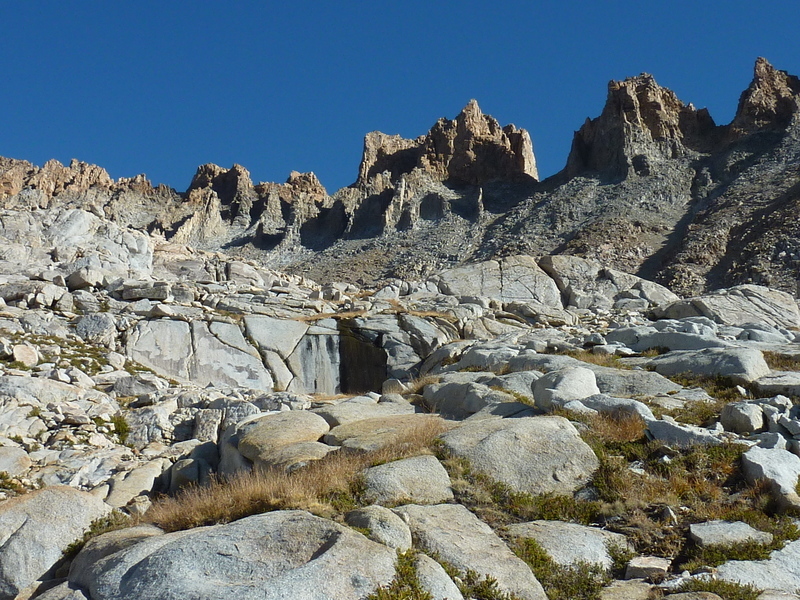 Tommey planned to climb Black Kaweah, the jewel of Kaweah Ridge and on the SPS list which he was actively pursuing. Our peaks shared the same approach from Little Five Lakes down to the Big Arroyo, after which our routes would diverge. In trying to talk Tommey into joining us, we used the argument, "You can always climb Black Kaweah by yourself, for Squaretop you're going to need a partner." We didn't know if this was actually true, but the difficulty rating (class 3 for Black Kaweah, class 4 for Squaretop) suggested it was likely to be the case. We had come prepared with a rope, two harnesses, and some other gear in case the class 4 rating turned out to be stiff. Tommey, already known for his waffling on objectives, was torn, changing his mind several times while we breakfasted and got ready to head out. With the sun having just risen as we were doing our morning stretches, his last flop was to join us for Squaretop. At the end of the day, he would not be disappointed with his choice. Matthew had not slept well, suffering from altitude sickness with a bad headache he'd had since the previous day and suffering nausea as well. In his place I think I might have elected to stay in camp all day rather than punish myself further by going to 13,000ft, but Matthew was made of stronger stuff than this and chose to join us regardless. It had been cold during the night, falling to freezing with thin ice forming on the edges of the lakes, but it was pleasant enough once the sun came up and we were descending to the Big Arroyo, about three miles from camp. From the junction just past the old log cabin found there, we turned southeast onto the High Sierra Trail and followed that for almost a mile and half before leaving it to head cross-country at the location I had identified on the GPS beforehand. It was suggested that we could, or perhaps should have turned off earlier, but the route worked fine. It's steep going up the southwest side of Kaweah Ridge, climbing some 3,500ft in two miles. We were aiming for the intermediate point at an unnamed tarn below Squaretop, following roughly up the drainage formed by the tarn's outlet. Without making much effort to stay on the heels of the others, I followed a somewhat different route further west, losing them not ten minutes after leaving the trail. The going was slow due to loose, sandy soil and I felt myself dragging behind as I meandered with the drainage on my way up. By the time I reached treeline, still some 600-700ft below the tarn, I was surprised to see no sign of the others ahead of me on the boulder and talus slopes. I climbed halfway up this slope, occasionally looking back for signs of them, before I paused to sit on a prominent rock for five minutes to do a better search behind me. Still seeing no sign, I once again thought they must have gotten well ahead and so I started back up to the tarn. I had the lake to myself when I arrived at 9:45a. Knowing they would stop here before starting up to Squaretop (I did a scan of the route ahead to be sure), I filled my water bottles and settled in to eat a portion of the lunch and snacks I had brought with me. I didn't have long to wait, Tom only 15min behind and the others close on his heels. Not surprisingly, Matthew was not feeling any better but he made no complaints. We spent another 15min at the lake before we felt ready for the messy part ahead, as ugly in practice as it looked from below. 1,300ft of nasty sand and scree and precious little solid rock, a combination that saps one's strength and makes you question why we do this as a hobby. Not quite an hour was consumed in this endeavor and we were relieved to finally reach the notch between Squaretop and Bilko Pinnacle. The latter was considered the "bonus" peak today, but I wanted to attempt it first in order to give us more options after summiting Squaretop, the stretch goal being a traverse further west to Michaels Pinnacle. Secor has scant words for the climb to Bilko from our saddle - "This is supposed to go class 3 directly from the saddle between Squaretop and Bilko Pinnacle." The operative word here is "supposed" which suggests Secor hadn't done the route personally and others have found the route more challenging. There is a ramp of sorts heading up to the left around to the northwest side and it was this that we hoped would be the key to the class 3 route. It was not. Going first, I soon got onto spooky ground well above class 3 and paused while the others looked for better options. They found none. Not wanting to start making class 5 moves on a class 3 route, I backed down and we retreated to the saddle to lick our wounds. The alternative route listed by Secor involves a downclimb of "40 feet to the southwest and go around a sharp buttress." This was more like 100ft and we didn't feel like doing that and then coming back up to do Squaretop. Our plan quickly changed to Squaretop first, Bilko second. Squaretop did not go so well at first either. The first ascent party went up (and rated) the class 4 Southeast Face which was just before us. It looked a bit scary, but there had to be something workable up there, right? Tommey declared he would head back down rather than climb it even as I started up to take a look. Matthew and Tom suggested we try the class 4 Northwest Face route, the only route we had known someone to use - Sean O'Rourke had used it two years earlier on his traverse of the Kaweah Ridge. That didn't sell me on it because Sean could climb circles around the rest of us and just because he found a way up didn't mean we could. "And what makes you think that route is easier?" I asked, giving Matthew a disbelieving eye. "Because 1970 class 4 is easier than 1935 class 4," was his reply. I paused, knowing this to be true in most cases. "Ok, let's do the other route." By now I didn't really care which one we tried so long as we tried something. It seemed we'd been stuck at the saddle for an hour and I was beginning to think we might not make it to either summit today. After this point, things began to work nicely in our favor. The traverse across the southwest side of Squaretop is fairly easy, save for a short class 4 downclimb into the chute that Sean had prewarned me of. The crux of this had some loose rocks the size of toasters that I dislodged before placing a nut with a cheater sling to aid the uncertain descending move "just in case." It was easier than it had looked and we all came down through it without needing the sling, Tommey removing it as the last one to pass through. Once in the broad chute which is really just left of the center of Squaretop from the southwest side, the climbing settled into some regular class 3, not so scary and very much like we'd remembered on Black Kaweah's Southwest Face. Though the route is called the NW Face, it could probably more descriptively be called the SW Chute as it comprises 80% of the route followed by a last climb out onto the NW (though more accurately, West) Face. This chute can be reached directly from the tarn below without needing to go first to the saddle (and thus avoiding the class 4 downclimb). Near the top of the chute the route goes to class 4 as one climbs out to the right on a series of short ledges steeply up towards the summit. Seeing me heading towards this, Tom though perhaps an exit to the right earlier in the chute might be easier and went off to explore it. Losing sight of Tom, it was Tommey I next saw coming up the chute below me as I headed higher into class 4 territory. I waited some to make sure both Tommey and Matthew could get through this section before continuing on. Tom, who had been out of sight and hearing for perhaps 15min suddenly appeared above us at the summit. His route had worked, but not without a class 5 lieback he wished he hadn't needed to make. We found the crux of our route where the West Face turns to become the NW Face just below the summit, a bit of a reachy pull up through a corner before easier ground led to the top. It was 1p when we reached the top to join Tom, all of us elated. I commented to Matthew that I thought it was the most difficult climb I'd seen him do without a rope. He didn't seem to agree with this, certainly not at first, replying, "Really? I thought Devils Crags was harder." I reminded him that we used a rope on a short section for that one. He thought more on it, but couldn't come up with another climb to refute it. This could have been because his thoughts were elsewhere - now that we had reached over 13,000ft, his nausea was getting the better of him. His stomach wanted to vomit what little content it had (he had not eaten much all day because of the nausea) but all he could manage were some strained dry heaves. There was little we could do for him but offer some sympathy (and take his picture). For his part, Tommey had no regrets for not going to Black Kaweah, happy to have joined us on this adventure. He was giddy and dancing around the summit like a kid, asking for his picture to be taken in various poses almost to the exclusion of everything else. Though well over 13,000ft in height, our summit was overshadowed on the Kaweah Ridge by Michaels Pinnacle to the NW and Second Kaweah to the SE. These in turn were overshadowed by yet higher summits (Red Kaweah and Big Kaweah) on either side, but these were blocked from our view. To the northeast stretches the beautiful lakes and alpine meadows of Kaweah Basin framed by the Sierra Crest around Mt. Whitney in the background. And to the southwest lay the Big Arroyo, Little Five Lakes and the high peaks of the Great Western Divide and those of the Mineral King region. The only disappointment we had was in not finding the summit register that we had anticipated. After spending half an hour at the summit we started back down. Tom and Tommey retreated back down the crux move on the NW side while Matthew and I set up the rope to allow Matthew to rappel the 30-40ft of the route he was least comfortable with. The 30m rope easily reached Tom who was waiting down below the crux back on the west side. After Matthew rapped safely down to the others, I packed up the rope and followed down. After safely negotiating the rest of the class 4 downclimb with Matthew, we decended the chute, reclimbed the short class 4 at the beginning and then reversed the traversing route back to the saddle with Bilko Pinnacle. All that is said in a few sentence, but of course it chewed up some time, and it was 2:30p by the time we began the 100ft descent from the notch to reach the class 4 Southwest Ridge route for Bilko. As advertised, we found the 30-foot class 4 section where the chute was narrowest near the bottom. It was not all that difficult, perhaps a bit softly rated compared to the route we'd just done on Squaretop. At the top of the chute the route grows easier, reduced to class 3 as we moved to the SW Ridge proper and followed this up in fairly quick fashion to reach the summit by 3p. Tommey posed for us again on the more impressive, but lower north summit before joining us at the top. It took a second, more thorough search before I stumbled upon the small film cannister I'd been looking for, the Smatko register from the second ascent party. The name Bilko derives from Bill Schuler and Andy Smako who named it after themselves in much the same way they had done (or rather, attempted to do) for dozens of other summits in the 1960s and 70s. Only a few of these aggrandizing names have survived the test of time, however. There were only six other entries since they had placed it in 1969, though undoubtedly others had been here and failed to find the register. In fact Sean's name was missing from his earlier visit, so we took a moment to add his name before adding our own on the last page. Flush with the success of two class 4 summits, we were all in fine spirits now with the exception of Matthew who continued to suffer the effects of altitude sickness he'd been dealing with since morning. More dry heaves on Bilko did nothing to relieve his suffering. I really had to marvel at his grit to put up with such discomfort. Almost as soon as we had reached the top I had started examining the east side to see if we might not be able to go down that way. I knew from the view at the tarn that the saddle east of Bilko was no more than a class 2-3 affair. The intial step off the summit to the east was a difficult one, but Tom found a way by heading south off the top and then circling back around to the east side where we found the going straightforward. We thus came to find that the route from the saddle east of Bilko is class 3 and perhaps that was the source of confusion in Secor's book - it seems plausible that the first ascentionists may have gone up from that side and either they reported the ascent from the wrong saddle or Secor got something wrong in translation. From pics it looks like Matthew and Tom sometimes wore helmets, and Tommey not. Curious if Bob Burd wears a helmet on any Class 4 sections? Yes, Bob was wearing one. Tommey didn't have one as Squaretop wasn't his original goal. Turns out that our route was fairly solid so there really wasn't a need for helmets.